Christmas morning is always special at our house. We open our Christmas gifts throughout the day, not just in one mad rush, and we stop mid morning for a nice Christmas breakfast or brunch. 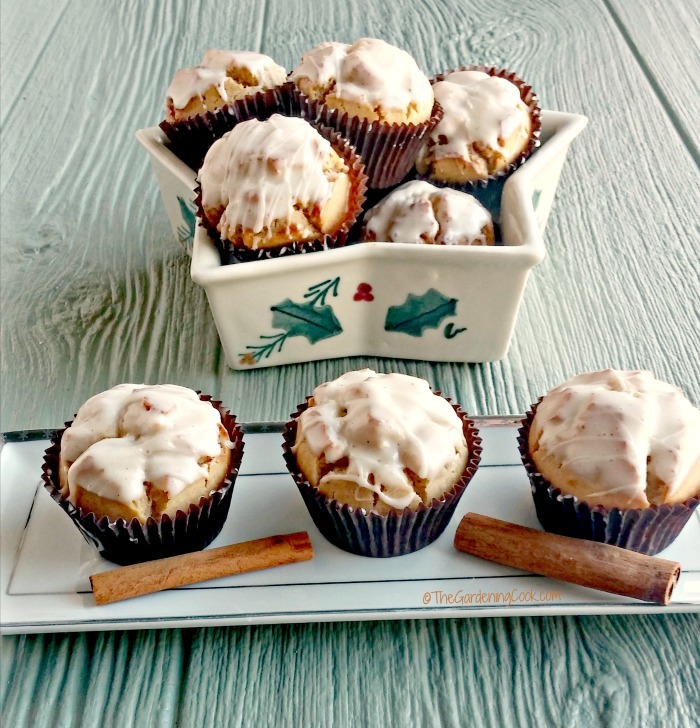 These eggnog muffins will be sure to become one of our holiday favorite brunch additions in years to come. 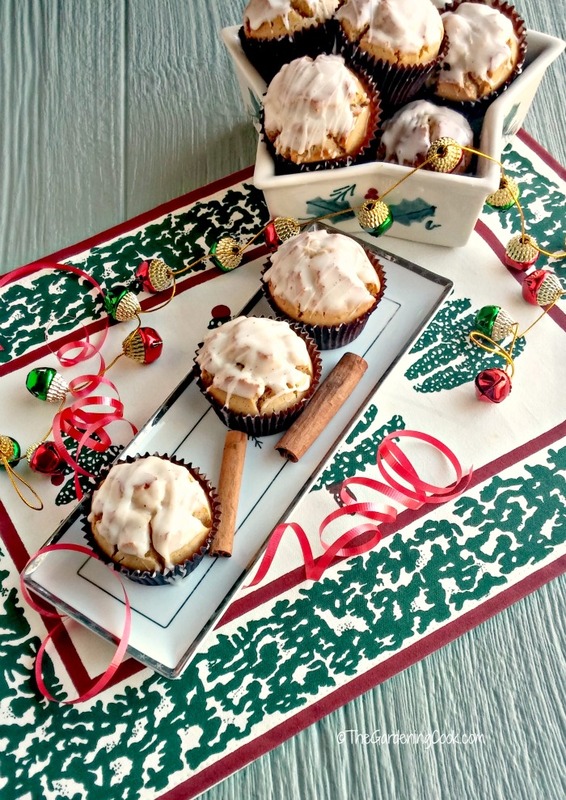 It’s Christmas morning with these delicious eggnog muffins. I LOVE eggnog. As in, let me just dive right in there love it. However, I learned years ago that me drinking eggnog straight does not agree with me. But combined into these tasty muffins? A match made in eggnog heaven folks. They are THAT GOOD. The muffins are a lovely blend of eggs, eggnog, brown and white sugar, spices and flour, (plus a few extra goodies). all combined with Crisco® Pure Vegetable Oil. 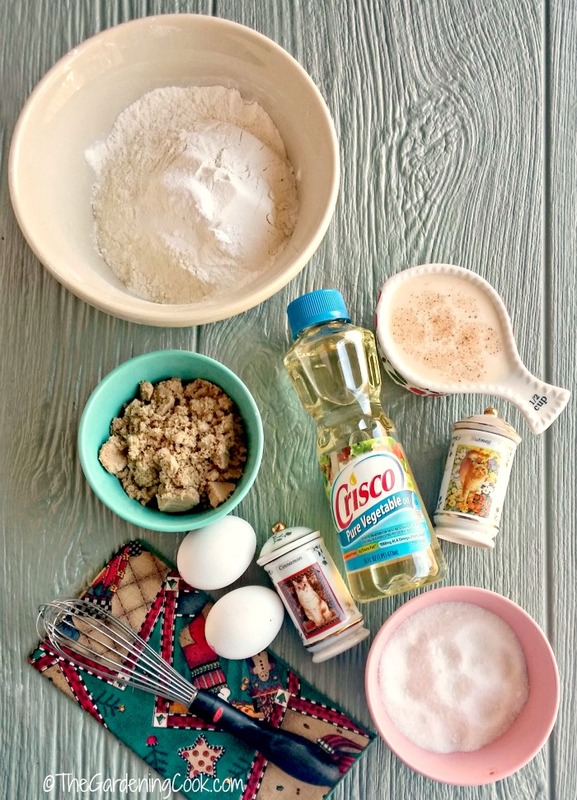 I love using Crisco oils in my holiday baking recipes. This oil has a very light taste that really lets the flavor of the other ingredients shine through. It makes all my holiday baked goods taste wonderful. With ingredients like these ~ how can you go wrong? The muffins are a cinch to make. Assemble all your ingredients before you start the recipe. I do this for every recipe. It saves time and frustration finding out in the middle of a baking attempt, when you discover that the brown sugar you were SURE you had on hand has gone all hard and can’t be used. Be sure to mix your dry and wet ingredients separately. 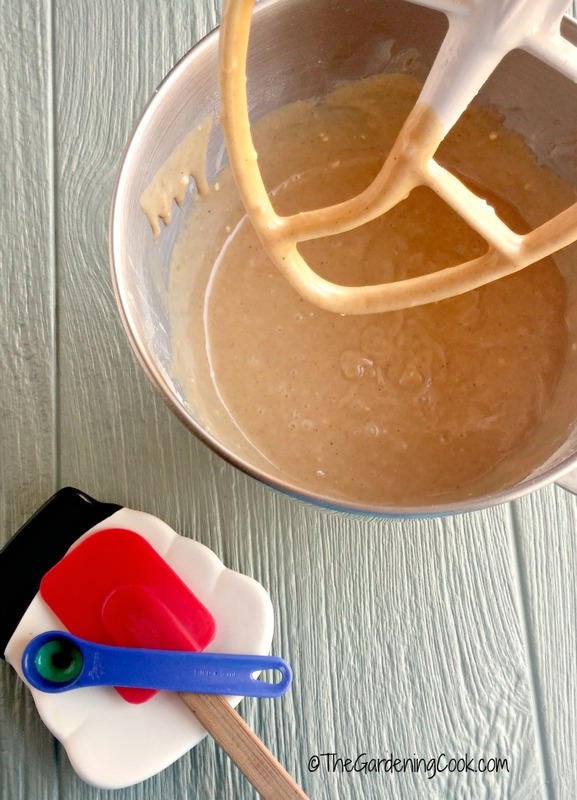 Doing this allows the flour and baking powder to be whisked and then added gradually to your mixed wet ingredients for perfect muffin results every time. Doesn’t that batter make you want to jump right in for a taste? I fill my muffin cups about 3/4 full. This makes for nice plump muffins with a rounded top that is easier to dip into the eggnog glaze later. And that glass of eggnog? That’s for the cook, of course! There is nothing quite like holiday baking for the cook…just ‘sayin… Out of the oven they come, and on to a wire rack to rest for a few minutes while I prepare the glaze. These look so tasty right now. It’s all I can do not to sample one, “just to make sure they turned out okay!” I love the cracks and craters that formed on these eggnog muffins. They make a perfect landing spot for the scrumptious glaze that I am about to make! The glaze could not be easier to prepare. No cooking at all was needed! All I did was put the powdered sugar into a bowl, added a pinch of nutmeg (’cause what is eggnog without nutmeg? I mean, I ASK you!) and then just added the eggnog until the glaze was thick and came off a spoon easily. I am so glad I resisted trying one before this step! This eggnog glaze is TO DIE FOR. Spicy and creamy with the flavor of holiday eggnog. What a perfect way to start your Christmas morning! Seriously…look at these muffins. Don’t you just want to take a virtual bite of of one? 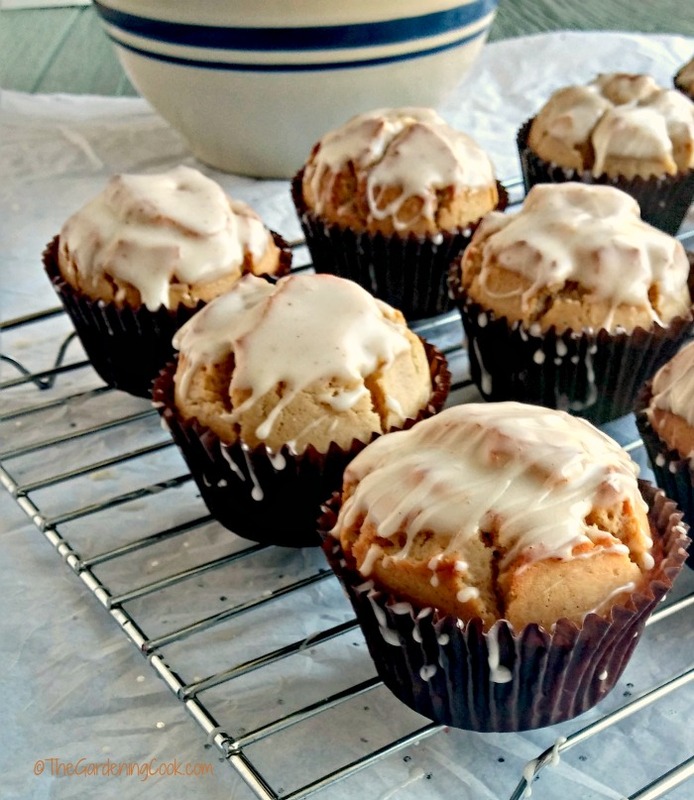 The muffins are fluffy and delicious, with a hint of holiday spices and just enough eggnog to make them creamy and rich. Then dipped in an eggnog glaze? Well…I defy you to just eat one! And now what to do with that left over eggnog? Perhaps Santa would love a glass of it to enjoy with his Christmas cookies! Or maybe I will make his Christmas treat a muffin this year instead! Who says Santa only eats cookies on Christmas eve? 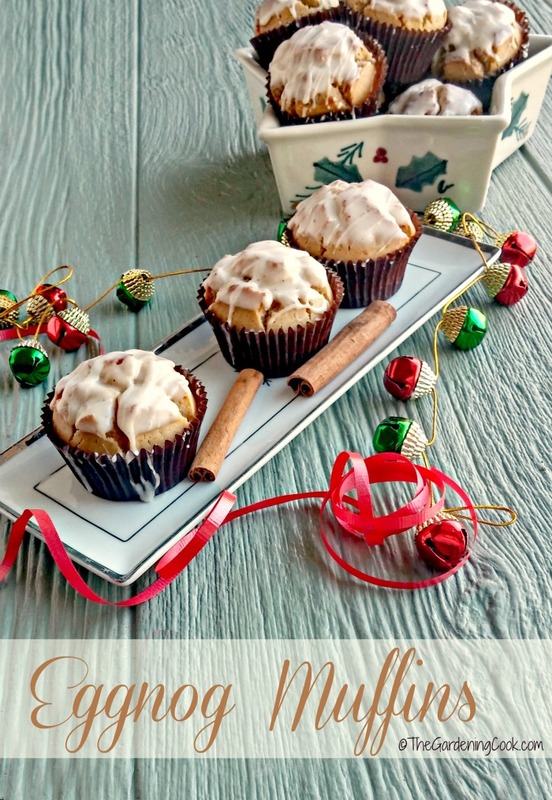 Would you like to create these eggnog muffins for your family? 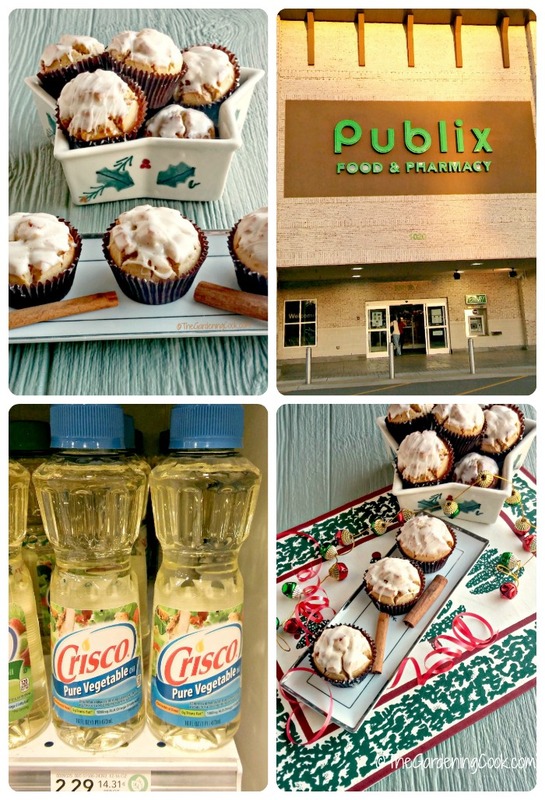 Head on over to your local Publix store, a member of the Ahold group of Stores, to purchase the Crisco® Pure Vegtable Oil and the other ingredients. The store is well laid out, very neat and well displayed and the employees are super helpful. Looking for some great holiday baking ideas? Please visit this recipe hub. The site has lots of holiday recipes and many tips, tricks and ideas to make this holiday baking season the best one yet. 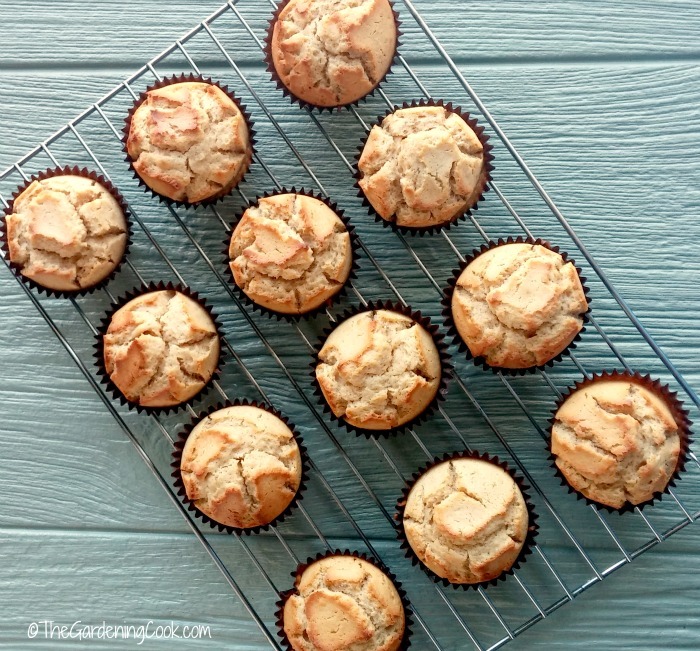 If you love muffins, be sure to also check out these banana chocolate chip muffins. 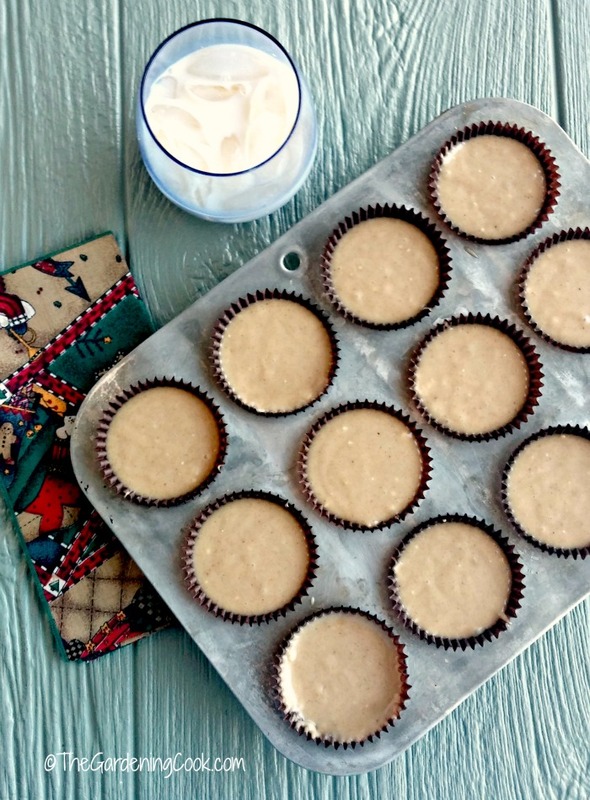 They are the perfect way to use ripe bananas. And please share ~ What is your favorite thing to add to your Christmas morning brunch menu? I’d love to hear your ideas in the comments below. Preheat your oven to 400º F. Line a 12 cup muffin pan with paper liners; set aside. In a medium bowl mix together the flour, baking powder, cinnamon, salt and nutmeg. 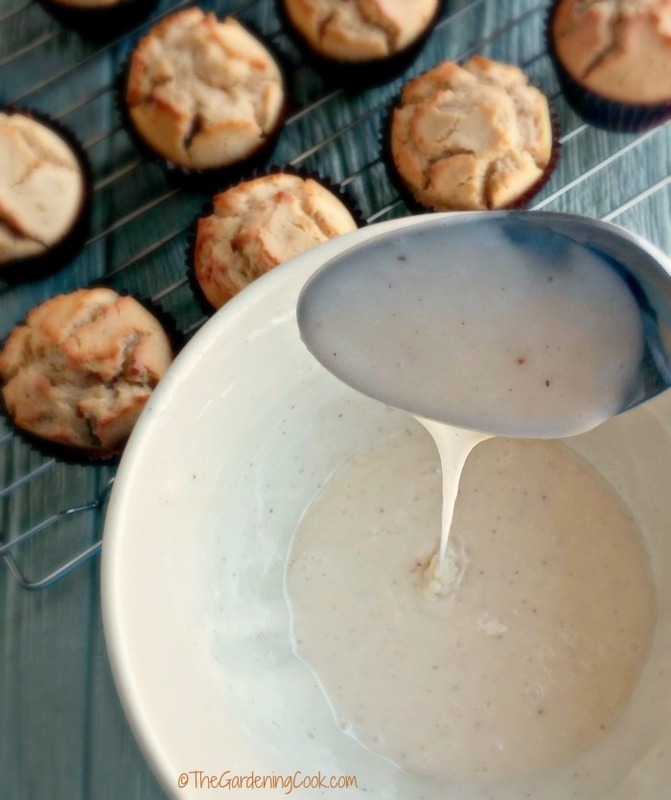 In the bowl of a stand mixer, mix the eggnog, vegetable oil, sugars, eggs, and vanilla. Gradually stir the dry ingredients into the wet until they are well combined. Cool for about 5 minutes in the muffin pan before transferring to a wire rack to cool completely. To make the Eggnog Glaze: In a medium bowl add the confectioners sugar, and gradually add the milk until mixture is thick yet can run off a spoon easily. Dip the tops of the muffins into the glaze and place on a wire rack to set for about 15 minutes. Store in an airtight container. ENJOY!